Been going through some of my old stuff, and found some stuff from the CUCR magazine Street Signs (archive online here). This is from page 18-19 of Volume 1, Issue 5, Spring 2003. The issue also has a lovely interview with Paul Gilroy about The Streets, Fran Tonkiss on “inner city values”, Michael Stone on Laurie Grove in New Cross, Les Back interviewing M Y Alam, Hiroki Ogasawara visiting Walter Benjamin’s grave, and a beautiful celebration of Flemming Røgilds. 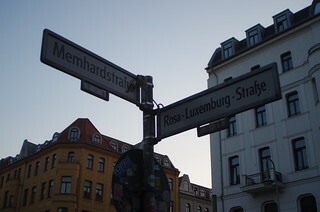 The article below describes my first proper academic conference, in Leipzig, and reflects on the relationship between Jews and the left in the darkness of the 20th century, and how that darkness is remembered by historians and leaves its traces in urban space. Since I wrote it, some of the people in it have passed away, including Arnold Paucker in 2016 (age 95). The transit bus from the airport into Leipzig arrived at the exact time given on the time-table. The bus glided through the flat monotony of the Saxon countryside, entering a zone of urban sprawl, in which it was impossible to distinguish which low-rise concrete box contained homes and which contained factories, warehouses, offices. The grey postindustrial landscape was punctuated here and there by Vietnamese signs, testimony to the historic links between East Germany and Communist Vietnam. From the bus station, we crossed over the no-man’s land of a wide ring road (“good for tanks”, as my Yiddish teacher, Gennady Estraikh, pointed out – a fact he knew from the bitter experience of living most of his life in the Soviet Union) into the beauty of the baroque town centre. Since reunification, Leipzig has been a jewel in the East’s crown, receiving heavy regeneration investment. “Leipzig is coming” is the bizarre slogan of the tourist office, which describes it as a cosmopolitan, multicultural town (not something apparent from the faces of the people I passed on the street). This was published in the COMPAS Blog in May 2013. A couple of weeks ago, in Bermondsey, South London with my colleagues Ole Jensen, Simon Rowe and Ida Persson, we met a man called Albert, at the entrance to his council flat. Born on Christmas Day 1926, Albert had lived his whole life in Bermondsey (apart from his national service at the end of the war, spent in Scandinavia). He had lived over half a century in his current flat, since it had been built as part of the massive post-war social democratic housing expansion whose legacy completely dominates the landscape of South London. He worked as a drayman at the Courage brewery, brought up three daughters and a son – and slowly watched his neighbourhood change almost beyond recognition.